Whoa! Wait a minute! We did live in that cabin, then in November 2018 we moved to Marquette. That story begins here: change of address. But for now, let’s get back to the cabin. 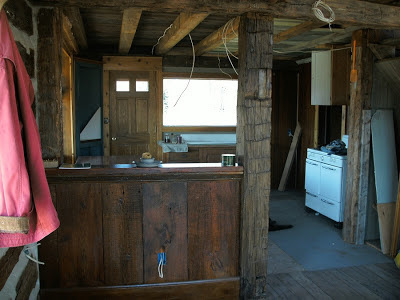 The cabin was built around 2002, 2003, by a young couple dedicated to salvage. The cabin consists of bits and pieces of 100-year-old barns and silos with windows and doors from various homes and cheese factories and Catholic schools and, well, I don’t know what all. They left it unfinished, which, I am sure, for me, was part of its charm. When Buster (Rest in Peace) and I moved in throughout the summer of 2011, we set about installing electricity, water, plumbing, a bathroom, closets, insulation, a ceiling, et cetera. There's the kitchen. What was I thinking? But how, in my early fifties, did I end up here? In a half-baked cabin made of salvaged parts, in a place removed, undertaking and living a life unfamiliar? 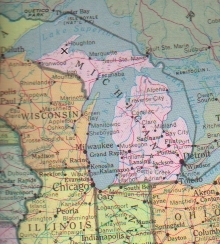 I had been living just about a half hour from Marquette, the peninsula’s largest city, where I had moved to and somewhat established myself just a few years earlier after a lifetime in and near Chicago. Now eight city blocks to a mile—that I know. But this? The Upper Peninsula is a somewhat wild place. It is tethered to it’s home state only by a gangly five-mile bridge that spans the turbulent Straits of Mackinac, a waterway that brings together the Great Lakes of Michigan and Huron. The U.P. provides Lake Michigan’s northern border and most of Lake Superior’s southern border; in many ways it is an extension of the North Woods of Wisconsin: piney woods, rivers, lakes, waterfalls, hardwood forests, sand dunes, mountains and hills, rutted two-track roads. It has a fascinating, rugged coastline with many small peninsulas jutting into these vast bodies of clear, cold water. There are bear and moose and trout and deer and wolves and skunks and coyote and porcupine; bald eagles and hummingbirds; wild blueberries, strawberries, cranberries, and raspberries. The people are interesting, sometimes strange, almost always nice, meaning relaxed and friendly, helpful. (It gives one pause, however, that so many chose Donald Trump to be our president.) Winters are long, snowy, and cold; summers are short, sometimes hot, always buggy. Spring is mud; autumn is beautiful. 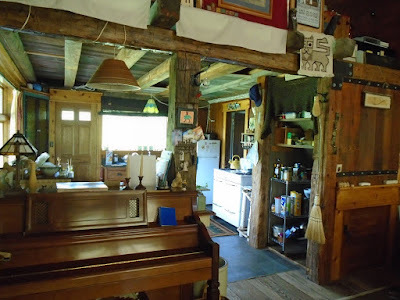 View into the kitchen summer 2015. I can only surmise my motives. I wanted to get farther—and further—out. To experience getting further into this. So one day my real estate agent brought me to this cabin that was neglected, unfinished, ankle deep in dead flies. But it stood tall in a field of wild grass surrounded by swaying wildflowers. It seemed like a dream abandoned. It played with my imagination. I mulled it over, then showed it to a friend who brought along his friend, a builder, who said, “The foundation and roof are solid, but … ” We walked over to the river which defines the north border of the property. As we were walking back on the path through the field, I stopped, looked up, took it all in, was overcome. I said: This is what I want. It was like falling in love. I had no idea what I was getting into. In 2018, I wanted out. The desire to leave, or, rather, not stay, may have begun much earlier. I loved living in the cabin, in a place of such peace and quiet, of truly dark nights, nights of brilliant stars and nights of moonshadow on the snow. I loved having deer stop by to graze in the yard; I loved spotting a flock of wild turkeys in the drive; I loved catching sight of a porcupine hunkered down in the branches of a tree. Living there sharpened my senses. And the quiet—it was immense. To have it broken on a still night only occasionally by the howling of a wolf or the howls and yips of a band of coyotes rather than blasted by someone slowly driving by in a pulsating vehicle, ba-boomp-da-boomp, ba-boomp-da-boomp—well, that was something I had longed for. But I found there to be an odd thing about living by myself, with no other human, in an area where humans, in general, were scarce. I could go for days without seeing anyone, and most often this felt just fine, but then sometimes not. The desire to walk out my door and down a street or sidewalk, to see a neighbor in passing, or a mailperson, a storekeeper, anyone, and maybe also to browse through a store, stop in a cafe, get a donut—some days that desire was strong. But too, that feeling would pass. Then I began noticing a deeper feeling, and I can’t quite describe it, it may not be a feeling at all, but something quite different. I just know that it felt deeper, longer lasting, and more a creeping kind of thing that would grow, that was growing, that would not go away, that might calcify, define my life; a thing that I feared. And even though I knew I had come to accept and was content being alone, this thing felt like a warning against … maybe a warning against isolation? Perhaps that’s it. I don’t know. But the feeling of just wanting to walk out the door and down the street at any random time on any random day in order to see any random person became stronger and stronger, almost as if it were a need rather than a desire. So I left the cabin, moved to the city of Marquette. 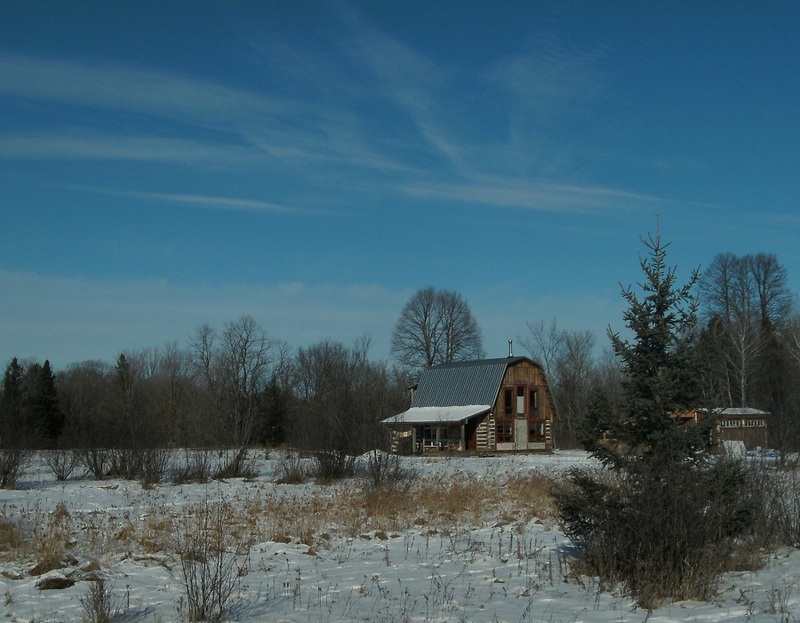 The cabin went on the market in January 2019 and sold quickly; it is no longer mine. I met the new owners briefly; they will bring to the place a fresh energy and joy. I had my time there, and it was wonderful—literally full of wonder. It was also at times very hard. If I can hold on to the spirit of the place while wandering along city streets, I will be grateful.